I have my traditions. I wrap presents while watching Santa Claus Conquers the Martians on Christmas Eve. The last few years, I’ve followed that with the Clive Owen King Arthur, an unjustly underrated movie, though I has nothing at all to do with Christmas. And I love listening to Christmas music, I have a decent collection. The past week or so, I’ve been sharing some of my thoughts on Christmas music on Facebook thanks to the 10 Day Christmas Song Challenge. In honor of the day, let’s talk about my ten choices. I have to go with “Hark!,” which is a song I’ve always loved because it’s a song that meant to be sung with great gusto. 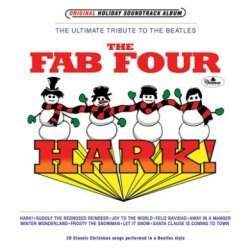 I particularly love The Fab Four’s cover of it, as they do it in the style of The Beatles’ “Help!” They did two albums of Christmas songs in a Beatles style (recently rereleased on a single disc), and I blogged about them here. From faux Beatles to real Beatles, and oh, do I hate this one! It’s just… so… annoying! Paul McCartney is frightfully talented, but sometimes he has lapses of bad taste — like this song. “Wonderful Christmas Time” is chock full of forced cheer, and I can’t stand listening to it. It’s on par with Bob Dylan’s Christmas From the Heart, but that album at least is funny; this song is so serious that it’s dire. Familiarity breeds contempt, and as a staple of mall muzak for decades the song now oozes contempt. Oh! And I had no idea there was an official video for it, and it’s somehow even worse! And there is, I swear, a Gallifreyan Time Scoop making an appearance. “Wonderful Christmas Time,” I hate it! I am not really a Chipmunks fan, and I admit to loving Bob Rivers’ “Chipmunks Roasting on an Open Fire.” Yet, I do quite enjoy this song, because it’s one that we had on a record — yes, actual vinyl — when I was a child. This one’s pretty self-explanatory. It shows up in all sorts of commercials this time of year. Cell phones, luxury cars, flat screen televisions. You name it, “The Dance of the Sugar Plum Fairy” is its soundtrack. I thought about going with a Christmas carol, because they’re so familiar, but Christmas carols also have obscure verses that no one knows. Instead, I went with an old favorite, The Vince Guaraldi Trio’s “Christmas Time Is Here” from A Charlie Brown Christmas, which has a very simple lyric that everyone should know. There can be nothing more silly than spending the holidays with those homicidal exterminating machines from the planet Skaro — the Daleks! It’s not a great song — the Peter Gunn/surf rock beat is a little weird — yet there’s something totally wrong about hearing a Dalek ask for Plum Pudding. I’m a little disappointed that no one has, in the past three or four years, remade this song. Imagine if Billie Piper resurrected her musical career with this song and if Nick Briggs did the Dalek voices! That would be brilliant! In general, it’s “Walking in the Air” that conveys to me the Christmas feeling, and I happened to like this cover version which I heard recently for the first time. “Walking in the Air,” as you probably now, originated in the animated special The Snowman, and it paints an evocative dreamscape of winter imagery. This song reminds me of the gang of characters who worked for me at EB Games. During December, the in-store muzak would switch over to Christmas stuff, and there were songs that I grew tired of quickly, like the Christmas songs by Mariah Carey and Britney Spears. One song that stood out was this one — “Spread a Little Love on Christmas Day.” It turned up on the muzak in December with some regularity, and it almost never passed without mockery because it has terrible lyrics — “I got your back on Christmas Day.” Really? That sounds positively Grand Theft Auto, which considering that EB Games sold Grand Theft Auto may have been the point. Suffice it to say, “I got your back on Christmas Day” doesn’t have an especially Christmassy message, y’know? This one is for my niece, who is a little past her third birthday. The song speaks to the anticipation in Christmas, where the days are counting down and you just cannot wait. 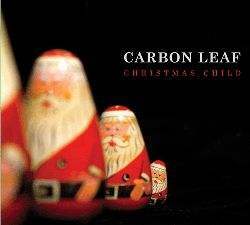 This is an acoustic version of “Christmas Child”; the original version led off Carbon Leaf’s Christmas Child album of last year. My review of the whole album is here. Can I ask for this much? How about some love and understanding in this world? But haven’t we enough atomic bombs to kill us all? There’s a Christmas message I can endorse. That anyone can endorse. And there you have it. Ten Christmas songs, all in response to a Facebook challenge. My next Facebook music challenge, as I mentioned a few days ago, will be the 30 Day Beatles Song Challenge.